This itinerary was updated for current pricing and travel options in February 2017. The original list of Japan’s Three Views is mirrored by a countless number of lists with the top three of everything in Japan. In this post I will introduce what is agreed to be Japan’s best three gardens, or Sanmeien, and suggest itineraries to visit these three gardens in a limited amount of time. All information is provided according to the DISCLAIMER and all information contained in this post is accurate as of the date it is posted. I really love Japanese gardens. They help to define tranquility and serenity in their settings, no matter what their purpose. I’ve been to a few in Japan, notably Rikugien in Tokyo, and in a good number of the buddhist temples that I’ve visited around the Kyoto area. I must confess though that I’ve never been to any of these three defined as the best. I will definitely mark at least one of these on my list of places to visit in Japan during my future travels. But even if you don’t visit these three, there are plenty of gardens around the country to whet your appetite. Kenroku-en is a Japanese garden in the city of Kanazawa, in Japan’s northern Chubu region. It was originally a private garden for one of the country’s most powerful samurai clans. A restoration project begun in the late 1700’s after it was destroyed by fire. It was opened to the public in 1874, a few years into the Meiji Restoration which brought the era of samurai and feudal lords to an end. It is open from 7 AM to 6 PM during the summer months, and 8 AM to 5 PM during the winter months. Admission is 310 yen; for 500 yen you can buy a “Kenroku-en Plus One” ticket, which also includes admission to one additional attraction in the Kanazawa area. In March of 2015, Kanazawa was linked to the country’s high speed rail network, making for a quick trip from Tokyo… but since Kenroku-en is a considerable distance from Kanazawa station the best way to access the garden is by public transportation. Numerous buses operate on a frequent basis between the train station and the garden: trips take approximately 15-20 minutes at a cost of 200 yen. JR Bus operates a few buses per hour, but not as much as the other local buses operated by Hokutetsu Bus. These JR buses are free if you have the Japan Rail Pass, although the cost of the bus is cheap enough that you can just pay for the next trip to the garden and back. Perhaps the easiest way to get around, though, is on the Kanazawa Loop Bus. These buses for tourists run every 15 minutes at a cost of 200 yen per trip – or for 500 yen you can hop on and off the bus as many times as you want in one day, as well as any local Hokutetsu bus in the area served by the loop bus. Passes can be purchased from the Hokutetsu Ekimae Center, at Kanazawa Station’s east exit. There is also a shuttle bus that goes directly between Kanazawa Station and Kenroku-en every 20 minutes for 200 yen (100 yen on weekends and holidays), though it looks like the One Day Pass for the Loop Bus is not valid for this shuttle bus. Koraku-en with Okayama Castle in the back. Photo by Wikipedia user Fjkelfeimvvn, released under CC Attribution 3.0 unported. There are several popular locations in Japan referred to as Koraku-en. If you ask for Koraku-en in Tokyo, you’ll be taken to Japan’s most famous sports venue for boxing and professional wrestling. But if you search for a famous garden called Koraku-en, you’ll be directed to a location in the city of Okayama, in the Chugoku region. Like Kenroku-en, Koraku-en was built as a pleasure garden by a feudal lord, and was a private garden until it was completely opened to the public during the Meiji Restoration. And like Kenroku-en, it has suffered through destruction (twice!) and been rebuilt. 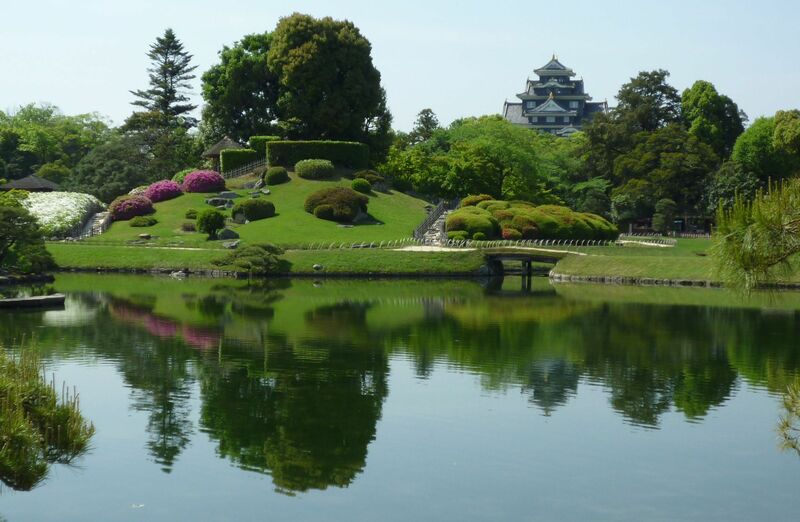 One of the striking features of the garden is the presence of nearby Okayama Castle, which appears to blend in to the scenery. It is open from 7:30 AM to 6 PM during the summer months, and 8 AM to 5 PM during the winter months. Admission is 400 yen, with combination admission tickets available with nearby attractions including Okayama Castle and the prefectural museum. The nearest major train station is Okayama, a major stop on the Shinkansen (bullet train). From here, you have a few options: You can walk the entire distance to the garden in approximately 30 minutes, you can take a city bus from the station to the garden (15-20 minutes on Bus #18, 140 yen, departs every 20 minutes), you travel halfway to Koraku-en on the tramway (100 yen to Shiroshita station, 5 minutes) and walk to Koraku-en in about 15 minutes, or you can go the entire way by taxi for around 1000 yen. Kairaku-en. Photo by Flickr user LuxTonnerre and released under CC-by-2.0. 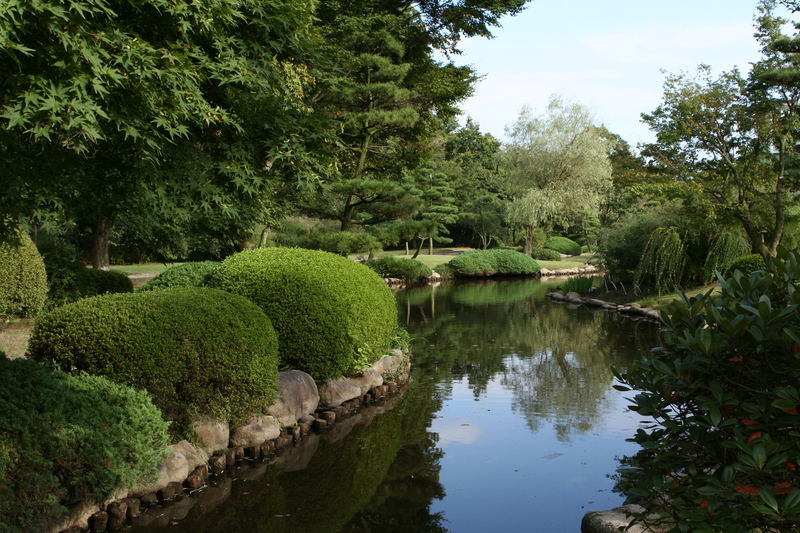 The final of Japan’s three great gardens is actually in Ibaraki prefecture, just a stone’s throw away from Tokyo. There are several differences between Kairaku-en and the two other gardens on the list: Kairaku-en was built much later, in the mid 1800’s. The garden has been open to the public since it first opened. It is widely known for its plum tree blossoms in February and March. There is a traditional building within Kairaku-en that requires an admission fee, otherwise the garden is completely FREE to enter. Operating hours are 6 AM to 7 PM during the plum blossom season and summer months, 7 AM to 6 PM during the winter months. Kairaku-en suffered damage after the earthquake and tsunami of March 11, 2011. Full restoration work was completed in February, 2012. The nearest train station to Kairaku-en is Mito Station, which is on the JR Joban Line. Joban Line trains are now directly linked to Ueno, Tokyo and Shinagawa stations: Limited Express “Hitachi” and “Tokiwa” trains are the fastest (70-90 minutes and 3,820 yen from Tokyo Station), while local trains reach Mito in 2 hours 15 minutes from Tokyo Station (2,270 yen). The trains actually pass Kairaku-en before arriving at Mito. You can reach Kairaku-en by walking for 30 minutes, by taking a bus (15 minutes), or by taxi in 10 minutes for around 1,000 yen. During the plum festival, a temporary station right next to Kairaku-en is opened for disembarkment. There is also a highway bus that runs from Tokyo to Mito Station in approximately two hours. SOME of these buses stop at a stop called Daikumachi, which is almost to Mito station. The fare is 2,080 yen to either destination. From this stop you can walk SOUTH directly to Kairaku-en in 15-20 minutes along route 342. 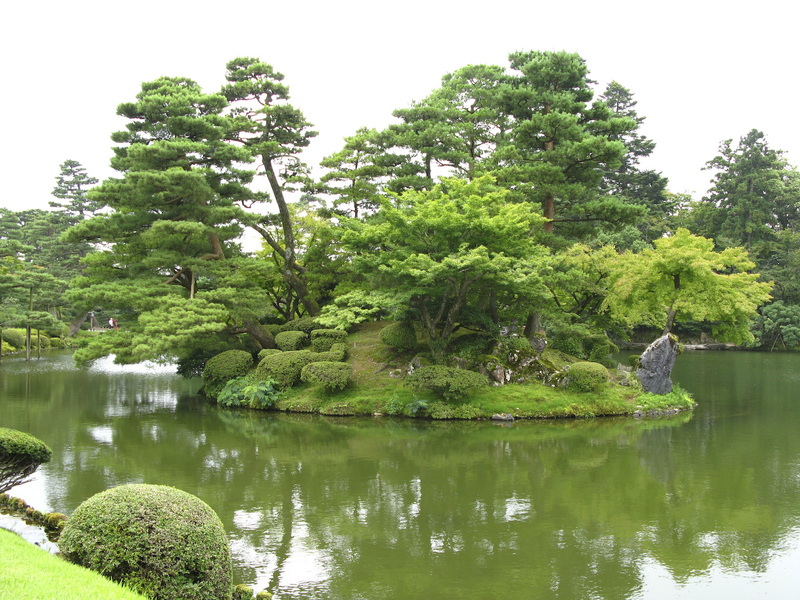 And now for the short travel itineraries that cover just these three jewels of Japanese gardens. As in my previous post, there are four different routes suggested. Two each from Tokyo and Osaka, and two each using the train and the bus. For buses, note that bus companies sometimes offer discounts for advance purchases. Day 1: In the morning, depart from Tokyo station on a “Hitachi” or “Tokiwa” Limited Express service to Mito station (70-90 minutes, 3,820 yen, no charge w/Rail Pass) or by local train (2 1/4 hours, 2,080 yen). Walk from Mito Station for about 30 minutes to Kairaku-en, or take a taxi (around 1,000 yen one-way). Return to Ueno Station in the afternoon via “Hitachi”/”Tokiwa” or local train. In the evening hours, depart Tokyo for Kanazawa on the Hokuriku Shinkansen “Kagayaki” or “Hakutaka” bullet train service. “Kagayaki” trains are the fastest, taking 2 1/2 hours, while the “Hakutaka” makes more stops and adds around 45 minutes to the trip. The fare of 14,120 yen is the same – there is no charge for Japan Rail Pass holders. Spend TWO EVENINGS at a hotel in Kanazawa. Day 2: Spend the entire day in Kanazawa, utilizing the Kanazawa Loop Bus to get around the city’s major sites, including Kenroku-en. Day 3: In the morning, depart for Okayama using the “Thunderbird” limited express between Kanazawa and Shin-Osaka, followed by the Shinkansen between Shin-Osaka and Okayama. The “Thunderbird” begins departures at 5:35 AM; the faster services leave Kanazawa just after the top of the hour at 8 AM and 9 AM. Be sure to change at SHIN-OSAKA, which is the shinkansen transfer station. By Nozomi it takes as little as 3 1/2 hours at a cost of 13,070 yen. Rail Pass holders can reach Okayama in around 4 hours, but using one of the morning “Thunderbird” trains to connect to a “Sakura” bullet train service will get you to Okayama a little sooner. In the afternoon visit Koraku-en and nearby Okayama Castle. Spend the evening in Okayama. Day 4: Return from Okayama to Tokyo on the bullet train at your leisure to complete the trip. By direct “Nozomi” the trip takes approximately 3 1/2 hours (17,130 yen). A direct “Hikari” service leaves every hour for Tokyo (4 hours) and is the best option for Japan Rail Pass holders – otherwise a change of trains at Shin-Osaka is necessary. For this course, a 7 Day Japan Rail Pass is recommended (29,110 yen). Day 1: Depart from Tokyo for Mito using the bus from Tokyo Station (2 hours, 2,080 yen) or using the local train from Ueno, Tokyo or Shinagawa (2 1/4 hours, 2,080 yen from Tokyo Station). Walk from Mito Station for about 30 minutes to Kairaku-en or take a taxi (around 1,000 yen one-way). If you are on a bus that drops off at Daikumachi bus stop, you can walk south to Kairaku-en in 15-20 minutes. Return to Tokyo from Mito Station by bus or local train. In the evening, leave Tokyo for Kanazawa by overnight bus. Options include the JR Bus and Willer Express. There are several nightly departures and buses reach Kanazawa in 7 1/2-9 hours. Fares typically start at around 5,700 yen for off-peak travel and increase during high demand. Day 2: Arrive in Kanazawa. Spend the entire day in Kanazawa, utilizing the Kanazawa Loop Bus to get around the city’s major sites, including Kenroku-en. Spend the night in Kanazawa. Day 3: Spend the day traveling from Kanazawa to Okayama, with a break in Osaka. In the morning, depart Kanazawa for Osaka. Options include JR Bus (Fares start at around 4,700 yen for off-peak travel). Spend the afternoon in Osaka. In the evening, depart for Okayama. If you are unable to secure a bus trip, the other option is to travel via the JR commuter train line all the way out to Okayama. You will want to depart on a “Shin-Kaisoku” or special rapid service – one change of trains will be required, usually in Himeji. The train fare from Osaka to Okayama is 3,020 yen and the ride takes approximately 2 1/2 hours if the connections are good. The train trip is slightly faster than the bus… but unlike the commuter train the bus has reserved seating and, like most others, makes a rest stop at a service area along the highway. Spend the night in Okayama upon arrival. Day 4: Spend the day visiting Koraku-en and the nearby Okayama Castle. In the evening, depart for Tokyo via overnight bus. Options include JR Bus and Willer Express (Fares starting from around 5,400 yen). Day 5: Arrive in Tokyo to complete your trip. *Check to see if Willer Express’ 3-day Japan Bus Pass (starting at 10,000 yen) would be cheaper than individual tickets from Tokyo to Kanazawa [Day 1], and from Okayama to Tokyo [Day 4]. Otherwise purchase regular one-way bus tickets. *A regular one-way bus ticket from Kanazawa to Osaka [Day 3] . *A regular one-way bus ticket OR train ticket from Osaka to Okayama [Day 3]. Day 1: Depart Osaka in the morning for Okayama by bullet train. “Nozomi” and “Mizuho” trains take 45 minutes costing 6,230 yen. Rail Pass holders should use the “Sakura” or “Hikari” with frequent departures. “Sakura” trains are generally faster, reaching Okayama in 50 minutes or so. Spend the day visiting Koraku-en and the nearby Okayama Castle. In the evening depart for Tokyo by bullet train. By direct “Nozomi” the trip takes approximately 3 1/2 hours (17,130 yen). A direct “Hikari” service leaves every hour for Tokyo (4 hours) and is the best option for Japan Rail Pass holders – otherwise a change of trains at Shin-Osaka is necessary. Be sure not to get back to Tokyo too late! Spend the night in Tokyo. Day 2: In the morning, depart from Tokyo station on a “Hitachi” or “Tokiwa” Limited Express service to Mito station (70-90 minutes, 3,820 yen, no charge w/Rail Pass) or by local train (2 1/4 hours, 2,080 yen). Walk from Mito Station for about 30 minutes to Kairaku-en or take a taxi (around 1,000 yen one-way). Day 3: Spend the entire day in Kanazawa, utilizing the Kanazawa Loop Bus to get around the city’s major sites, including Kenroku-en. Day 4: Return to Osaka at your leisure via the “Thunderbird” limited express to complete your trip. Trains take approx. 2 hours 40 minutes and cost 7,650 yen to Osaka station. Day 1: Depart for Okayama by bus or train. Bus options include JR Bus (around 1 bus per hour, with fares starting at around 2,400 yen). The train trip is slightly faster than the bus… but unlike the commuter train the bus has reserved seating and, like most others, makes a rest stop at a service area along the highway.. Spend the afternoon in Osaka, visiting Koraku-en and the nearby Okayama Castle. Day 2: Arrive in Tokyo, and depart from Tokyo for Mito using the bus from Tokyo Station (2 hours, 2,080 yen) or using the local train from Ueno, Tokyo or Shinagawa (2 1/4 hours, 2,080 yen from Tokyo Station). Walk from Mito Station for about 30 minutes to Kairaku-en or take a taxi (around 1,000 yen one-way). If you are on a bus that drops off at Daikumachi bus stop, you can walk south to Kairaku-en in 15-20 minutes. Return to Tokyo from Mito Station by bus or local train and spend the night in Tokyo. Day 3: Spend your day in Tokyo, then leave in the evening for Kanazawa by overnight bus. Options include the JR Bus and Willer Express. There are several nightly departures and buses reach Kanazawa in 7 1/2-9 hours. Fares typically start at around 5,700 yen for off-peak travel and increase during high demand. Day 4: Arrive in Kanazawa. Spend the entire day in Kanazawa, utilizing the Kanazawa Loop Bus to get around the city’s major sites, including Kenroku-en. Day 5: Depart Kanazawa for Osaka to complete your trip. Options include JR Bus (Fares start at around 4,700 yen for off-peak travel). *Check to see if Willer Express’ 3-day Japan Bus Pass (starting at 10,000 yen) would be cheaper than individual tickets from Okayama to Tokyo [Day 1] and from Tokyo to Kanazawa [Day 3]. Otherwise purchase regular one-way bus tickets. *A regular one-way bus ticket from Kanazawa to Osaka [Day 5].